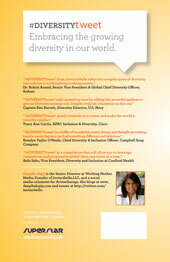 #DIVERSITY tweet Book01 | THiNKaha: Become a recognized expert in your field of expertise. Compelling thought leadership content. Section 1: What Does Diversity Really Mean? Embracing the Growing Diversity in Our World. 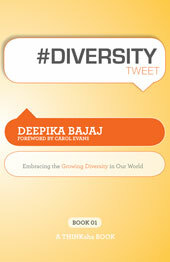 ‘#DIVERSITYtweet Book01’ is a must read for people who interact with diverse cultures, languages and the world at large. With the current globalization and technological advancements, we are seeing an exponential growth in diversity in our world. People are transcending cultures and geographies and are embracing diversity in their experiences and interactions with others. Most importantly, this book is a thought provoking resource for managers and those who work with a diverse group of people, be it in the workforce, community projects, team building assignments, social gatherings, or business meetings. Organizations need to know how to manage diversity to be successful in the future, and in today’s competitive age, the flexibility and creativity augmented by diversity is crucial for success. By the end of 2010, Twitter will have roughly 18 million registered users. What does this have to do with diversity and inclusion? The momentum has begun. The content is being developed in 140 characters; and identities are being created, new interpretations of diversity are being developed – with it we are observing new breakthroughs and breakdowns for Diversity. There is a paradigm shift – Diversity is the NEW NORMAL. The book intends to create a bridge between a fresh and growing medium of expression and diversity and inclusion efforts. The message of diversity now transcends into thoughtful TWEETS and empowers the individual, an organization and its workforce. The big question is – Are you open to capitalizing on this momentum? ‘#DIVERSITYtweet Book01‘ is part of the THiNKaha series whose 100-page books contain 140 well-thought-out quotes (tweets/ahas). Deepika Bajaj is the Senior Director at Working Mother Media, a company providing support and community for women to find work life balance and founder ofInvincibelle, a company empowering diverse, multigenerational workforce and women to thrive in a multicultural world. Prior to this, Deepika has more than eight years of experience in telecommunications consulting and corporate marketing. She has served on the board of various professional organizations including the National Society of Hispanic MBAs and Women in Intel. Deepika is currently writing another book. This book (yet to be named) speaks to her experiences of being a global citizen and what is shaping the new voice of diversity. She speaks and consults on diversity, blogs atwww.deepikabajaj.com, writes a column on mom blogs at Working Mother Media and writes a column on social media for Active Garage. She is in the process to launch a new blog Diverseconomy.com. You can follow her onhttp://twitter.com/invincibelle. Deepika holds a degree in Engineering from Bangalore University, India and has an MBA in marketing from Fordham University, New York. She is an honorary member of Phi Kappa Phi and Beta Gamma Sigma. She loves kickboxing, reading, music, and painting. Currently, she lives in California.